As its core offering, Unravel provides highly qualified staff to lead meditation and yoga classes on-site, for all levels of employees, and at times that are convenient. The goal with all classes is to provide a safe environment, reduce stress, and create self-awareness around health and wellness. On-site classes can be arranged to accommodate weekly work schedules and be integrated into existing corporate wellness programs. The utmost care will be taken to ensure that the classes are professional and appropriate to your corporate culture and employee's needs. Classes are designed to meet the needs of all skill levels from beginner to more experienced yoga students. Why incorporate yoga? We've known for many years that yoga and meditation can positively affect our health, but only in the last decade have advances in neurological and biological studies allowed scientists to prove just how much a consistent practice of yoga and meditation may help us reduce stress and improve our health. Type in the phrase "effectiveness of yoga in the workplace" in Google Scholar and you'll find numerous studies providing evidence for the positive impact that practicing mindfulness, meditation, breath work, and yoga at work have. Studies reveal improvements in stress-reduction, back pain, cardiovascular disease, obesity,memory, aggression, anxiety, depression, mental health, weight loss, counterproductivity, developing emotional intelligence, gender empowerment, etc. And these are just the benefits an individual experiences. Employees that practice together are in effect experiencing a regular team-building activity that cultivates respect, understanding, cooperation, communication, and organizational strength. Combine these benefits with the need to offer competitive wellness programs that attract and retain employees and you have the perfect solution. 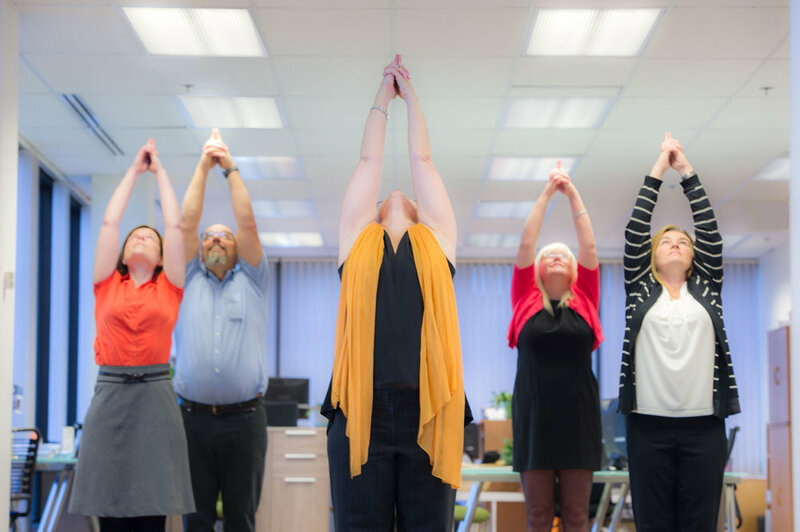 By combining the teachings in mindfulness, meditation, breath work, and yin and yang yoga into a regular practice, employees learn how to replace the fight or flight response with the rest and digest response. With a regular practice, these tools help employees manage and reduce stress, respond to others more positively, and find clarity to solving everyday work challenges. Request an appointment and reserve your preferred class schedule. A new use for the unused spaces: What will you need to host a corporate yoga class? A conference room, empty office, lobby, summer deck or wide hallway is all we'll need to get started. Students will need appropriate active wear (sweats ok) and a water bottle. Mats and props can be provided. How often? To experience steady progress, a regular practice of 2-3 times of yoga a week is recommended (i.e. Tuesdays and Thursdays or Monday, Wednesday, and Friday). Classes that are offered at lunchtime, before or after work are usually the most convenient for employees. Some employers choose to offer classes during regular business hours as a paid benefit. Who will lead? Unravel instructors are hired based on a high level of training, reliability, and integrity. Instructors will adhere to strict rules for ensuring an appropriate, professional environment with regards to dress, language, music, teaching style, and behavior. They will accommodate the needs of the employees ensuring that a safe and valuable practice is provided. A background check is performed on all instructors. All instructors are First Aid, AED, and CPR certified, insured, and registered with Yoga Alliance. How much is it? As costs for health insurance continue to rise, employers must continue to find innovative and cost-effective means to keep their healthcare costs down. Of course the best way to reduce healthcare costs is to improve the health of the workforce. Individual gym and fitness club memberships for employees are expensive and often go unused by many employees. What is needed for your busy workforce is cost-effective convenience. Bringing a highly-qualified yoga teacher that specializes in mindfulness, meditation, breathwork, and yoga to your work location, allows employees to simply "walk down the hall" to class for a highly-valuable experience. No time is wasted getting in the car, driving to another location, parking, and driving back after class. Unravel offers classes on a flat-rate basis, so the more employees that attend (only limited by the space available), the more value you, the employer receives. Pricing is purposefully simple and employers are invoiced by Unravel monthly. Discounts are available for multiple weekly classes.